In 1877 Édouard Stephan discovered a cluster of five galaxies in the constellation Pegasus. 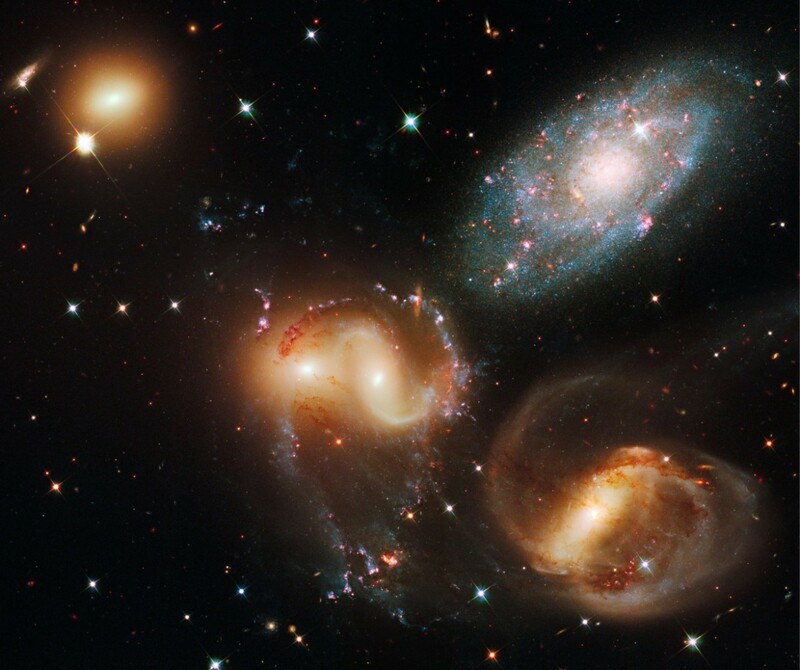 It came to be known as Stephan’s Quintet. At the time, the quintet was just thought to be a cluster of nebulae. It wasn’t until the early 1900s that we came to understand them as galaxies. We now know that four of these galaxies form a compact group, while the other just happens to be along the same line of sight. The compact group is one of the most well studied in the universe, and has even been the center of controversies over the nature of galactic redshift. For example, Halton Arp noted that the quintet appeared to be connected through tidal tails implying a gravitational interaction between all five. But the redshift measure of one galaxy is only about 800 km/s, while the other four are around 6,000 km/s. 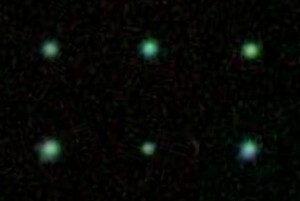 In the standard view, redshift indicates distance, thus the four form a cluster while the other is a foreground galaxy. But Arp thought that redshift was an indication of age, not distance, and he thought the tidal tails of the quintet was strong evidence of his idea. With more modern observations we can see that there are tidal tails between the four cluster galaxies, but not between the cluster and the foreground galaxy. We also have tons of evidence that redshift is a good measure of distance, and that the universe is really expanding. So the general consensus is that Arp’s ideas are wildly wrong. Fun fact: the quintet is probably most famous for its use in the opening scene of It’s A Wonderful Life, so it is likely the best known galaxy cluster. It’s amazing to see all those small red – and a few blueish – galaxies in the background of the picture. It gives you a real sense on how many galaxies there are really around.